I have tried several things to make this work but I cannot. Help? Within the same project directory, please open the "TheAmazingAudioEngine.xcworkspace" and not the "TAAESample.xcodeproj" file. Once the workspace is launched, be sure to switch the active scheme to "TAAESample," because the default is set to the "TheAmazingAudioEngine" scheme for some reason. Lastly, you'll want to switch the "Team" pulldown menu under "Identity" (within the General tab) to either "None" or your own iTunes Dev member account. Otherwise, you'll receive a failed sign in dialogue box with an option to fix the issue. FYI, I also didn't know how to successfully run the TAAESample, either. 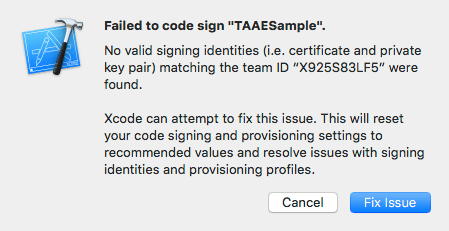 I had Xcode on Yosemite installed, and the Swift code that's used in the sample requires Xcode 7.3.1 on El Capitan. I'll fork the master repo and see if @Michael will allow me to add some installation instructions to the ReadMe to help with clarification. TAAE was written by developer of [Audiobus](http://audiob.us) and [Loopy](http://loopyapp.com) Michael Tyson, in consultation with Jonatan Liljedahl, developer of [AUM](http://kymatica.com/Software/AUM) and [AudioShare](http://kymatica.com/Software/AudioShare). 1. Download the repo as a zip file or run `git clone [email protected]:TheAmazingAudioEngine/TheAmazingAudioEngine2.git` from the Terminal command-line. 2. Within the downloaded "TheAmazingAudioEngine2-master" (zip) or the "TheAmazingAudioEngine2" (clone) project directory, be sure to open the **"TheAmazingAudioEngine.xcworkspace"** to successfully run and build the TAAESample app to the iOS simulator or your device. As for having the Xcode project's "TAAESample" scheme active by default, along with the team ID set to "None," that probably just needs to be re-saved with those settings set, and then pushed to master to affect future downloads of the repo. Duh that was stupid of me. Just realised I need to open the workspace before I read your response. Thanks. Hey, I'm glad that you got it work!